Better Than Chocolate was great and I found myself completely involved in the plot (which refreshingly wasn’t centred entirely round Samantha’s love life). The complications surrounding the family chocolate business and her focus on trying to save the company were really the main plot for the novel and I found it well thought out in that respect. I was pleased by Samantha’s determined attitude and her desire to solve things on her own despite facing the almost certain failure of her business. The scheme to get money infused back into the business was perhaps a little unrealistic but I actually completely was on board with the plan despite the lack of timing to execute- must have been Samantha’s convincing nature that made me a believer! Everything about this main business aspect of the novel was entertaining and interesting. Samantha’s love life was predictable but didn’t really matter as the other characters in the town and supporting her were wonderful- there were quite a few of them though so be warned you may lose a few who’s who along the way- this didn’t take anything away from the charm of the town and it’s familiar feel though. My one troubling aspect was with the family dynamic between our main characters- although each woman was well outlined and given a role I didn’t feel a huge amount of warmth between them. I understood that they were now living in different places and that this can sometimes create some distance but I felt that their relationships were missing that last link of authenticity. It also seemed strange to me that the responsibility for the business would have been left entirely to one daughter and that even the mother would be removed from it completely- especially as she’d installed her second husband there to help run it. I think there could have been a bit more back story with her mother, stepfather and father- although Roberts does give us a better picture of the stepfather eventually it’s so late in the story that I already felt a lack of sympathy for the stepfather and empathy for Samantha’s mother. Although I was a bit disappointed with the family dynamic I still enjoyed Better than Chocolate and I think there is another novel about the Sterling family which would be well worth a read. Thank you to Harelquin for our review copy. All opinions are our own. 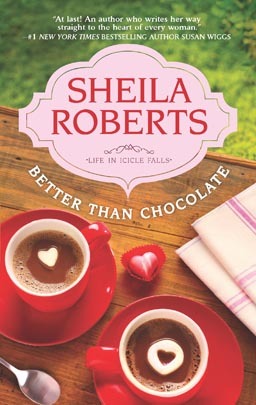 I first discovered Shelia Roberts when I found a book by her set in Icicle Falls. I love the little town and all the friends and stores they run. It is an easy light read. Shelia has some humor and love stories set in this quaint town. I loved it.